I began this art blog in 2007 and have posted all of my artwork and happenings pertaining to my artistic career since then. I have received notification that on 2 April 2019, Google will be shutting down consumer Google+ and will begin deleting content from consumer Google+ accounts. Photos and videos from Google+ in my album archive and on my Google+ pages will also be deleted. This is what worries me right now. Whenever I log-in to access my blog, it is through a Google+ account. I have tried to change the account to Google Chrome to no avail. It is quite possible that after April 2, my blog "Acrylic and Light, the Artwork of Alvin Richard" will still be visible on-line but if I can't log in, I will no longer be able make updates or add new posts. In other words, it will become inactive. In the event that this should happen then or afterwards, I will be starting a new blog on Google Chrome that will be entitled "Acrylic and Light, the Art of Alvin Richard". The internet address will be: https://alvinrichard-artist.blogspot.com/ . Hoping that you will continue to follow me and my artistic career. 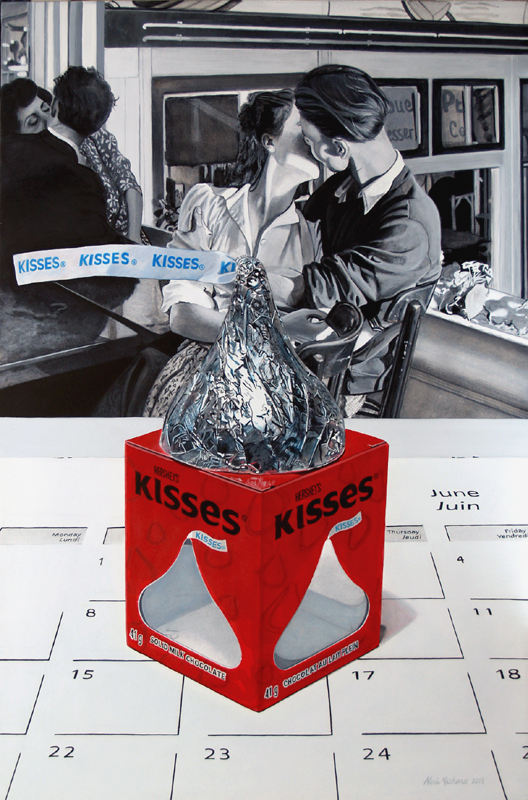 This is my third painting of what is turning so far into a mini Hershey's Kisses series. These larger chocolate Kisses are seasonal and are only available from Christmas through Valentine's Day. For my third instalment, I chose the iconic photo taken by Alfred Eisenstaedt while on assignment for Life magazine. 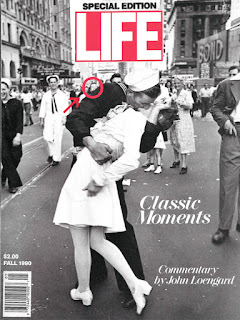 The picture entitled VJ Day in Times Square, VJ Day or The Kiss was taken on August 14, 1945, at the announcement of the end of the war with Japan. The persons who were later identified in the photograph are Navy sailor George Mendonsa (b. 1923) and dental hygienist Greta Zimmer Friedman (b. 1924- d. 2016). Many articles were published from the point of view of the photographer and both parties involved who did not know each other when the photo was taken. The spontaneous kiss was explained by George Mendonsa as a general thank you to all nurses for their indispensable service during war time. That afternoon, George Mendonsa was coming out of Radio City Music Hall with his girlfriend Rita, when victory over Japan was announced. In the photograph, Rita can be seen peeking over his right upper arm. In 2018, George and Rita had been married for 71 years. I used a Special Edition of Life Magazine, Fall 1990, acquired on eBay as the photo study for the painting. It is one of the magazine's most famous pictures in print. Rita is circled in red. Update-February 18, 2019 - It was announced today that George Mendosa died yesterday at an assisted living facility in Middleton, R.I. 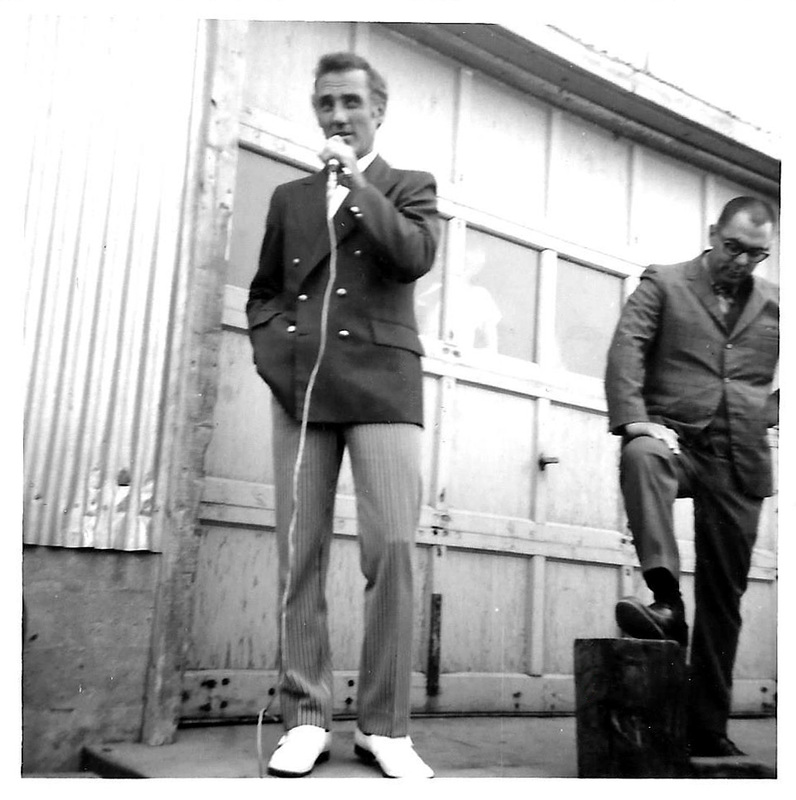 He would have turned 96 tomorrow. Rest in peace Mr. Mendosa. Condolences to his wife, family & friends. This past September, my wife Suzanne and I flew to Winnipeg, rented a car and embarked on a two-week road trip of Manitoba and Saskatchewan. These were the last two remaining provinces we had yet to visit of our amazing country. We did a ginormous 2465 km loop stopping in Portage-la-Prairie, Brandon, Whitewood, Regina, Moose Jaw, the Great Sand Hills, Leader, Saskatoon, Manitou Beach, Riding Mountain National Park, Wasagaming and our last four days were spent in Winnipeg. The flat terrain of the prairies with sight lines at the horizon that seems endless creates the sensation of vastness, wide-open spaces and big sky country. Almost all of the fields had been cut and harvested. All that remained were the odd bails of hay. While driving, my eyes were always scanning the landscape in a state of awe and wonderment. We did a lot of walking and sightseeing and got to see some amazing art from prominent prairie artists such as Leo Mol, William Kurelek, Joe Fafard, Victor Cicansky, Wilf Perreault, Dorothy Knowles, Ivan Eyre, Marsha Kennedy, Belinda Kriek and Andrew Valko. 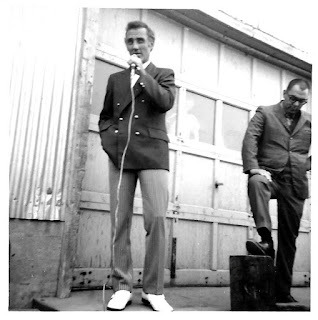 The only artist that eluded us was Karel Funk. In Saskatoon we visited the Remai Modern, a new public art museum on the Canadian landscape that opened in 2017. In a New York Times travel feature it was listed at #18 of the "52 Places to Go in the World in 2018". 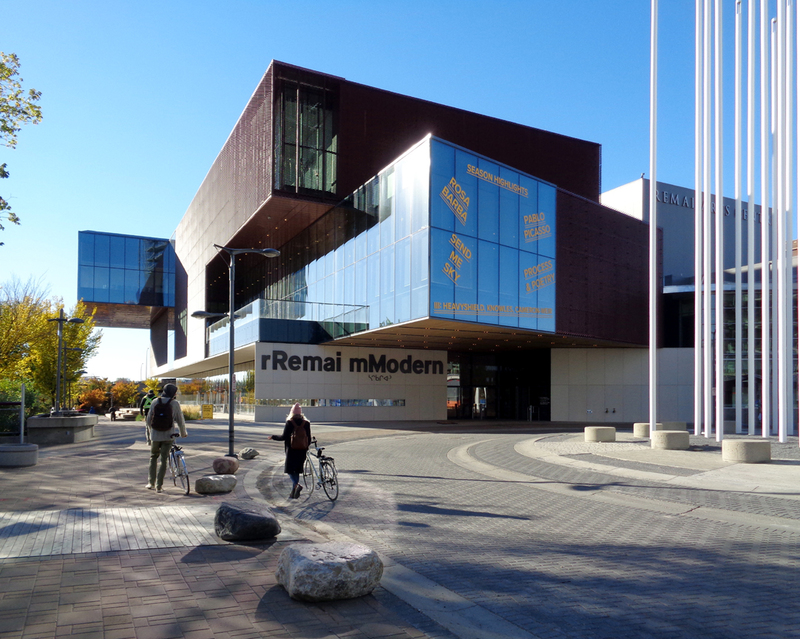 The museum replaced the Mendel Art Gallery that closed in 2015 and now houses the Mendel's art collection. Main patron, Ellen Remai has gifted the museum with an extensive collection of Picasso wood-cut prints evaluated at 20 million dollars. 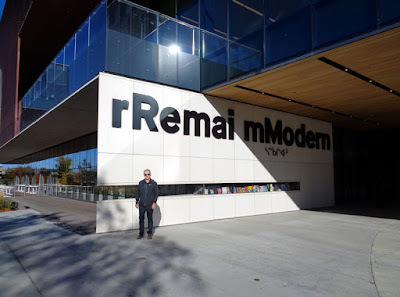 The photographic studies for this painting was taken in the gift shop of the Remai Modern. It was a technically complex imagery to undertake. I had to make several adjustments, edit and improvise many sections in order to achieve a composition to my liking. 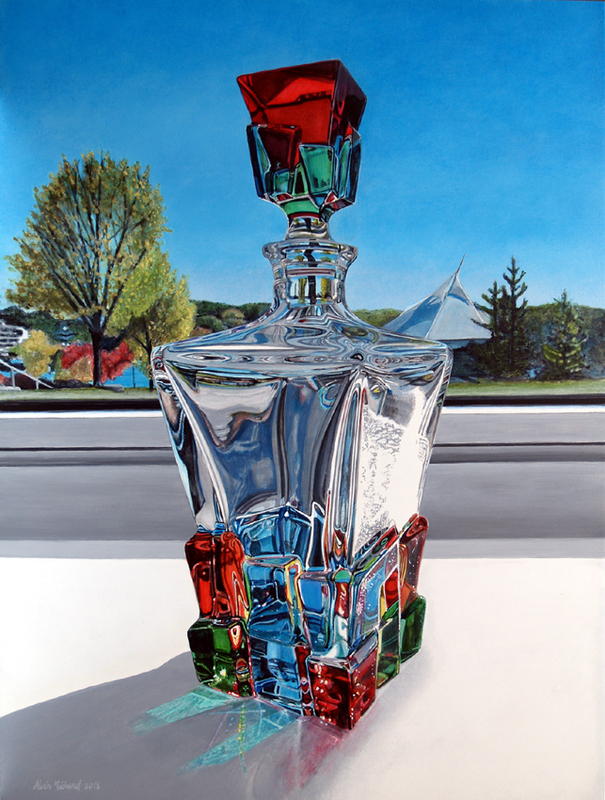 The art glass is a Gage Murano glass decanter. Also on display from this collection were drinking glasses and an open face bowl. The novel, “Tintin in the New World” was published in 1993, a decade after the passing of Hergé. However, chapters of Tintin in the New World had first appeared in it's entire form in Fiction (1975), Tri-quarterly (1975), Syntaxis (1984), Artform (1984) and De Brakke Hond (1984). It is perhaps Tuten's best known and most critically acclaimed work. It has been translated into six languages and has gone through several print runs. I had a chance to read the novel during a recent vacation and am in agreement with several critiques I've read on-line which were mixed. Tuten will be publishing a memoir, My Young Life, slated to arrive in bookstores in March 2019. Roy Lichtenstein had previously done artwork for a book cover of Tuten’s 1971 novel, The Adventures of Mao on the Long March. 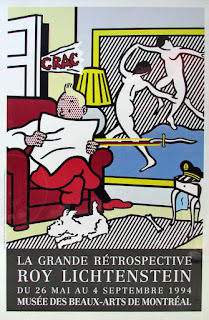 The artwork that appears on the cover of Tintin in the New World was especially done for the novel in 1993 and is entitled “Tintin Reading”. 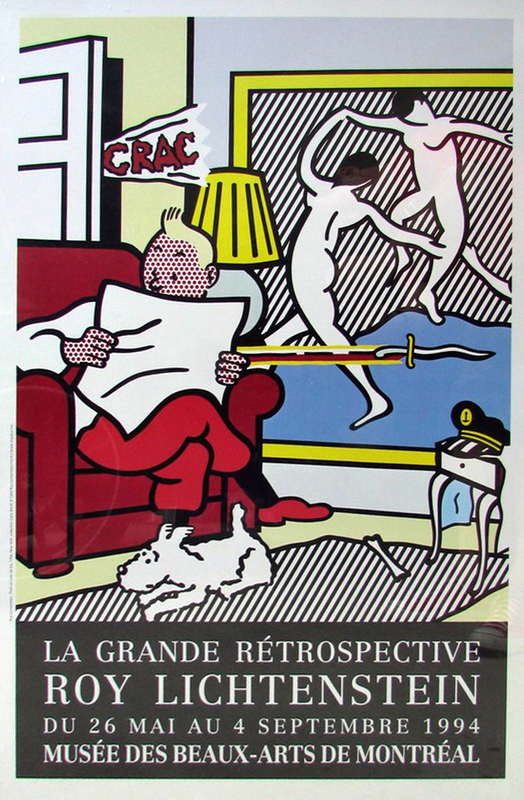 I only discovered the existence of the Tuten/Lichtenstein collaboration this past August by happenstance. I had acquired the collectible figure of Tintin reading in the big red armchair 2 years ago upon visiting the Tintin Boutique in Brussels, Belgium. "Coffret at home" was inspired from the pages of the comic book “L’oreille cassée" (The Broken Ear), published in 1937, page 10 and 11. Tintin was originally holding a book entitled “Voyages aux Amériques” by Ch. J. Walker, Graveau éditeur, 1875. I decided to play with the narrative and have Tintin read his own adventure in Tuten's novel instead. 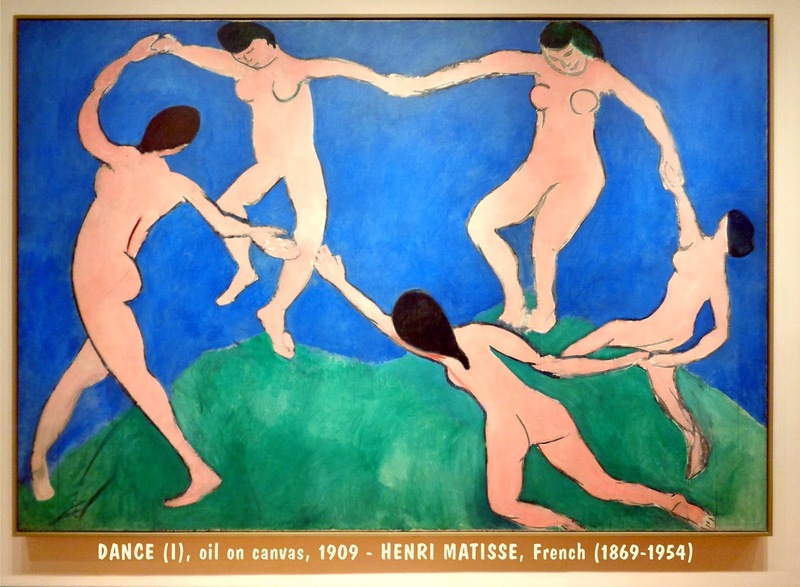 In the beginning of the novel, it is revealed that Tintin is an art collector and is amassing a collection which includes Danse by Henri Matisse which appears in the artwork. Capitain Haddock: "What about your art collecting? Have you given that up, too? 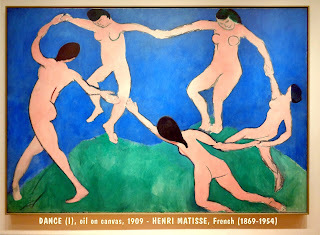 All those unopened crates of paintings you've left unexamined: that Matisse you spent ages to acquire- that one with all those naked dancing people- still in its shipping case." 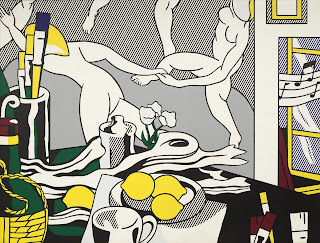 Lichtenstein had previously drawn inspiration from Matisse's masterwork when in 1973, he incorporated The Dance in a very large scale painting entitled, Artist's Studio- The Dance. Sculptor Seward Johnson is another artist whom was inspired by Matisse's The Dance and created multi-pieces 3-dimension bronze sculptures that included Matisse himself painting on a canvas and models. This painting marks the first time that I have use the camera from my iPod Touch to do the photo study for the painting. 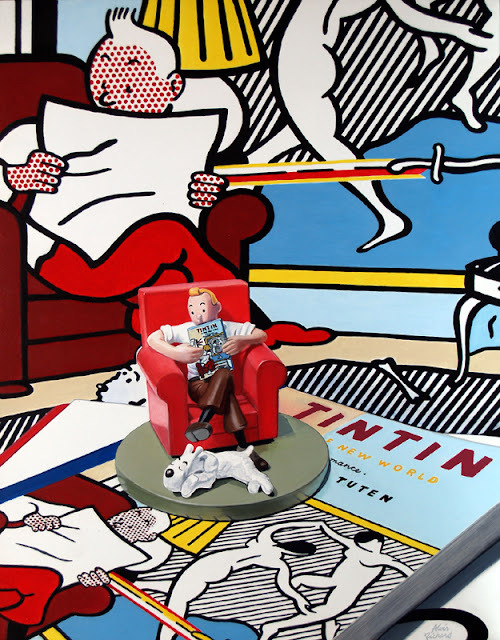 Trivia- Lichtenstein's Tintin Reading was also used for a retrospective of his work held at the Musée des Beaux-Arts in Montreal in 1994. This is my second of two paintings that will exhibited at Art Toronto with La Galerie de Bellefeuille of Montreal. The exhibition will be held from October 26 to 29, 2018 at Metro Toronto Convention Centre, North Building, 255 Front Street West, Toronto. Where does inspiration come from? For me it is often from getting a visceral response when I see something. I'll make a mental note, then eventually when other elements present themselves, much like making a small jig-saw puzzle, the image is revealed to me as a concept. It is funny how a mundane moment can inspire a painting. During my month long vacation in Europe this past May, I met a lady from La Rochelle, France while on my two-week, 330 km hike on the Camino. When I told her that my French ancestor, Michel Richard crossed the Atlantic in 1652 from La Rochelle, she replied that her first husband was actually a Richard and both of her children have Richard as their family name. After my return home, I received a friend request from her on Facebook. Some time had passed when she wrote me a short note on messenger to see what I was up to. She mentioned that their lives had return to normal and her husband was re-joined a club to play Tarot. I only knew Tarot as cards used for divination or fortune telling. When I Googled French Tarot, I learned that it is a card game using strategy played with 4 players. 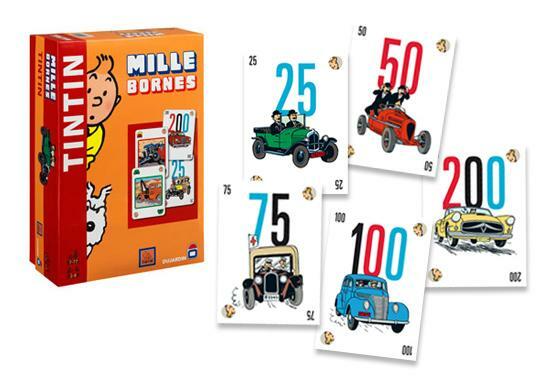 Among the Google images that appeared on screen was the French card game “Mille Bornes”. I got an immediate visceral response upon seeing this nostalgic game and the wheels started turning. 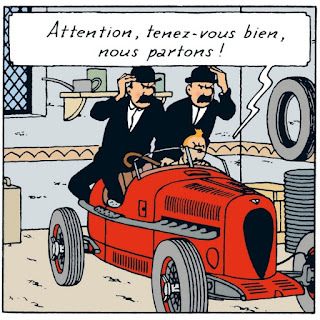 Thirty minutes later, I would find a Tintin at the wheel of a race car on eBay. 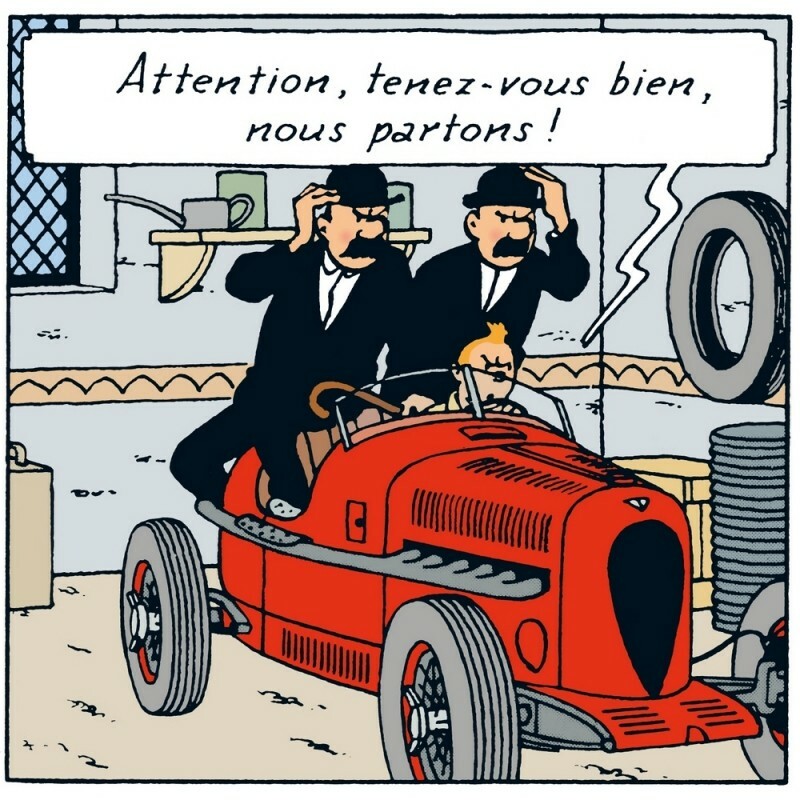 The die-cast car that also features Snowy and the Thompson Twins was inspired from the comic book, “Les cigares du Pharaon” (Cigars of the Pharaoh), page 66. I would also acquired a 1971 edition of Milles Bornes on eBay. I wanted to use this edition since it was that one that I played during my youth. Milles Bornes was created by Edmond Dujardin in 1954, with the card illustrated by Joseph Le Callennec. This card game based on a road trip is for 2 to 6 players, usually played by 4 players, 2 on each team, as a partnership. The object of this game is the first player or team to accumulate a total of exactly 5000 points in several hands of play. In so doing, players try to complete trips of exactly 1000 km/miles= 1000 points in each hand played. 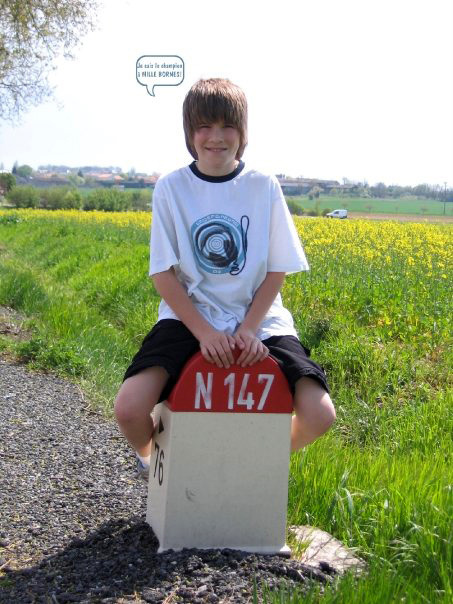 The term "Bornes" refers to the kilometre milestones found on many roads in France and Europe. 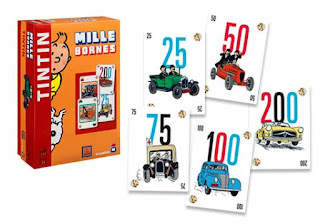 During my research, I also found a special edition of Mille Bornes based on The Adventures of Tintin. Ironically, as I was searching for an image for this blog post, the same sports car with our merry cast is featured on one of the cards. Trivia- The pop band Thompson Twins, part of second British invasion of the 1980 was named after the two bumbling detectives Thomson and Thompson from Hergé's comic books. This is one of two paintings that will exhibited at Art Toronto with La galerie de Bellefeuille of Montreal. The exhibition will be held from October 26 to 29, 2018 at Metro Toronto Convention Centre, North Building, 255 Front Street West, Toronto. 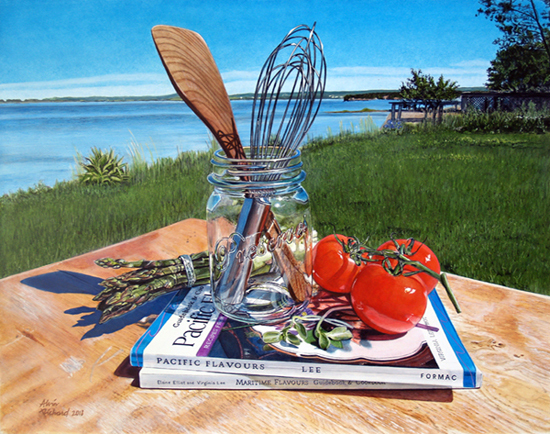 This painting is a commission piece for a lovely couple who have a summer home in the Annapolis Valley of Nova Scotia. My wife and I met them over a wonderful lunch she had prepared for us of seafood chowder, salad and trifle for dessert. I started to brainstorm ideas for a composition as we got acquainted, then did a photo shoot in their backyard overlooking the Minas Basin / Bay of Fundy. In the past, I have used mason jars in several of my paintings. These utilitarian bottles designed for preserving food become an allegorical form of symbolism when used in preserving personal objects, places, memories. I did the photo studies for the painting during low tide, when most of the basin had emptied out, revealing a muddy clay bottom floor. I was later sent photos taken at high tide and painted from several pictures. Without going into specific details, from our first meeting to delivering the finish painting I found the whole process informed me in creating a very biographical piece just by using props. Every objects and the space in the composition had personal meaning to her, all anchored on a table build by her grand father. On a personal note, this area is also dear to me since my French ancestor came to Acadia in 1652 and settled in nearby Port Royal. Along this basin's shore lies Evangeline Beach where the late artist, Alex Colville owned a summer cottage and used the setting as a back drop for several of his paintings. He lived in nearby Wolfville. When I started to concentrate on still life painting at the turn of the millennium, the artwork of Mary Pratt would become my main source of inspiration. What distinguished Mrs. Pratt from most still life painters apart from her signature approach to painting glass, light and colour palette was that she used the natural setting in and around her home instead of setting up a composition in a very neutral and unassuming space. On a very sad note, she passed away on August 14 after a lengthy illness at the age of 83. I completed this painting at the end of August and would dedicate the remaining hours in her memory. It is a great loss for her family, all those who loved her and the Canadian artistic community. This painting is my 9th to feature a red Meco charcoal grill which we've owned for some 20 years. Although it's been retired from use for at least a decade, I've have held on to it mainly for art sake to use as a prop. It still resides in our backyard. Last year it received a much needed makeover with a fresh coat of paint and new cedar plank side tables. It now looks as good as new. 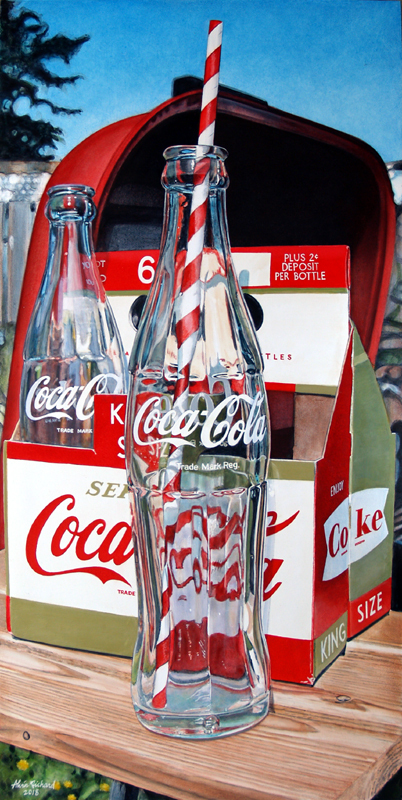 This iconic Coca-Cola bottle and carton are both from the 1960's. I was lucky enough to find these from two different Kijiji listings; the bottle here in Moncton, NB and the carton from Summerside. PEI. Part of group exhibition - Under Summer Skies being held at the Fog Forest Gallery, until September 8. This book arrived in the mail this week. One of my paintings was selected with 50 most talented artists from around the globe in PoetsArtists latest publication entitled "Glorious Color". Gratitude and appreciation to publisher Didi Menendez and guest curator, artist and writer Lorena Kloosterboer. Acrylic on gessoed mounted birch panel, 7 x 5"
I've just return from a one month stay in Europe. My main goal was to return on the Camino and complete the Puy Way in France that my wife and I had started last year. In 2017, we hiked 270 km from Puy en Velay to Figeac over 10 days. My wife would suffer a knee injury and we were forced to stop here. This year, I flew to Paris alone and did some sightseeing for three days before catching a train for Figeac. I had planned 19 days to complete the 480 km trek from Figeac to the French-Spanish border town of Saint-Jean-Pied-de-Port. By day-4, I would encounter my own problem by accumulating 12 blisters on my feet. After a week on the Camino, I decided to stop in Moissac for the weekend to give my sad feet a break. I would resume my hike for another week. The two days off and having to arrive one day ahead of schedule because of an on-going train strike, would force me to leave the Camino on day-16 since Aire-sur-L'Adour was the last town I had access to public transportation. In summary, I hiked a total of 335 km over 14 days plus 2 days of rest. I was very fortunate to have so many wonderful encounters and made many new friends during the whole trip. The Louis Vuitton Foundation, L'Orangerie, le Musée D'Orsay, Musée Rodin, Panthéon, les Invalides all in Paris. Le Musée-des-Beaux-Arts, Cité du Vin in Bordeaux. 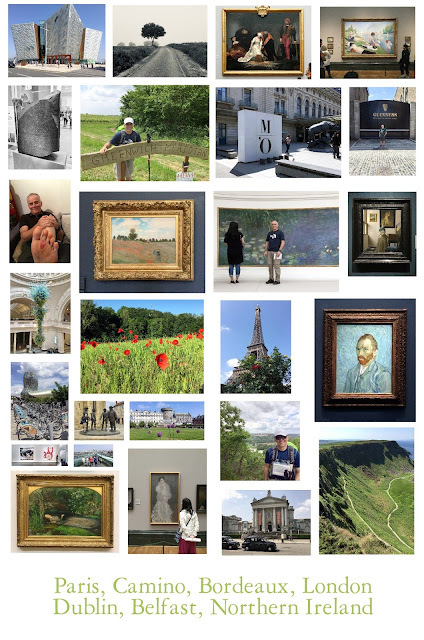 The Victoria and Albert Museum, the National Portrait Museum, the National Gallery, the British Museum, the Tate Modern, the Tate Britain, the Saatchi Gallery, the Chelsea Flower Show - all in London. The National Gallery, the Irish Museum of Modern Art, the Guinness Storehouse all in Dublin. This small painting was a gift to my friend Philippe and his wife Dora (an amazing classical pianist) who graciously invited me to stay with them during my three night stay in Paris. I met Philippe nine years ago while hiking the 800 km of the Camino Francés in Spain. We've kept in touch ever since. It was great to see him and meet his family. Last year, he completed both the ultra-endurance races of the Marathon des Sables in Morrocco in the spring and the Marathon des Sables in Peru in the fall. 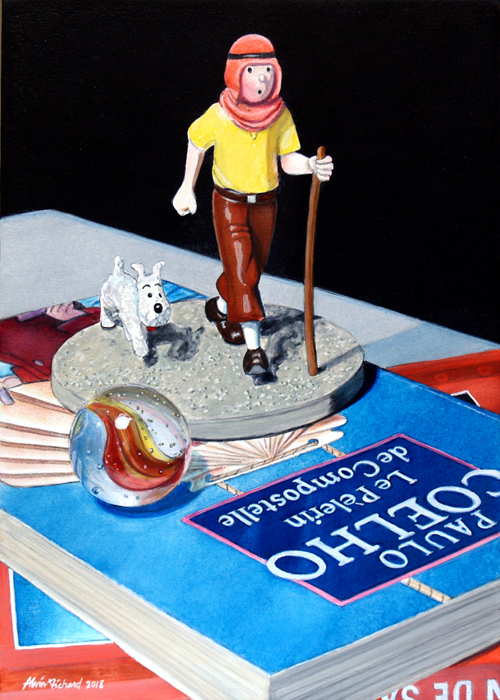 This composition features a Tintin figuring of Cigars of the Pharaoh resting on Le Pèlerin de Compostelle (The Pilgrimage) by Paulo Coelho. The book was published in 1987, a year before his runaway best seller, The Alchemist. The image is infused with symbolism that represents Philippe very well, not only for his athletic abilities but for his humanity as well. Private collection - Paris, France. Acrylic on gessoed aluminium panel, 18 x 14"
This painting was inspired by the iconic film “Breakfast at Tiffany’s” in which Audrey Hepburn plays the role of Holly Golightly, a naive, eccentric socialite in search of a wealthy man to marry. The movie also stars George Peppard, who plays the role of Paul, an unpublished writer and kept man who recently moved into a NYC apartment in the same building she lives in. The filmed is based on Truman Capote's novella of the same name and was directed by Blake Edwards. Holly: I don’t want to own anything until I find a place where me and things go together. I’m not sure where that is but I know what it is like. It’s like Tiffany’s. Paul: Tiffany’s? You mean the jewellery store. Holly: That’s right. I’m just CRAZY about Tiffany’s! I came across the new revamped Tiffany perfume and bottle last fall in a cosmetic brochure. The instant I saw it, the whole narrative popped in my head. It is by far the most expensive prop I’ve ever purchase for a painting since it was priced at $150. It is a marvel of design and comes in Tiffany's signature robin egg blue box. 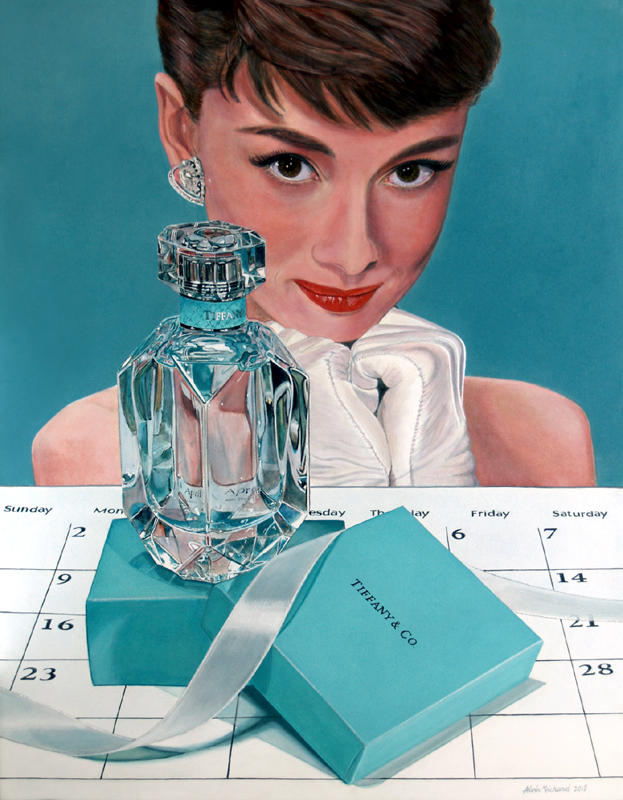 The image of Audrey Hepburn that appears on this calendar is credited to the Hulton Archive, circa 1950's. Audrey Hepburn is one of only four actresses to have won the EGOT, which is comprised of being a recipient of the four major American entertainment awards; an Emmy, Grammy, Oscar and a Tony. She was also revered for her humanitarian work as a UNICEF Goodwill ambassador. The part of Holly Golightly would earn her an Academy Award nomination for best actress in a leading role. -SOLD by Galerie de Bellefeuille in Montreal. When I did the photo study for this painting, I was cross-country skiing in Centennial Park in my home city of Moncton, NB while carrying a backpack with props and camera inside. 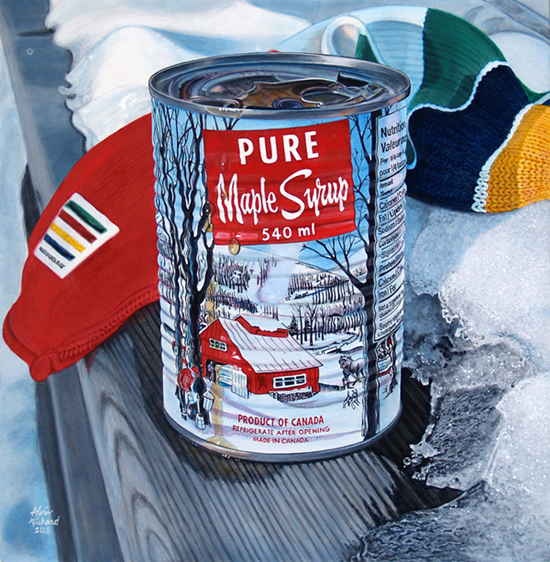 With this painting I wanted to document three things that are truly Canadian: Maple Syrup, the Hudson Bay Company (HBC) and Winter! The Hudson Bay Company was incorporated in 1670 and was a fur trading business for much of its existence before several acquisitions and mergers with other retail stores. It is the oldest company in Canada, predating the confederation by almost 200 years. I started the painting while the Pyeongchang Winter Olympics got underway. HBC was the official clothing outfitter for members of the Canadian Olympic team for the 1936, 1960, 1964, 1968 games and has been the official outfitter of both the winter and summer Olympiads since 2006. 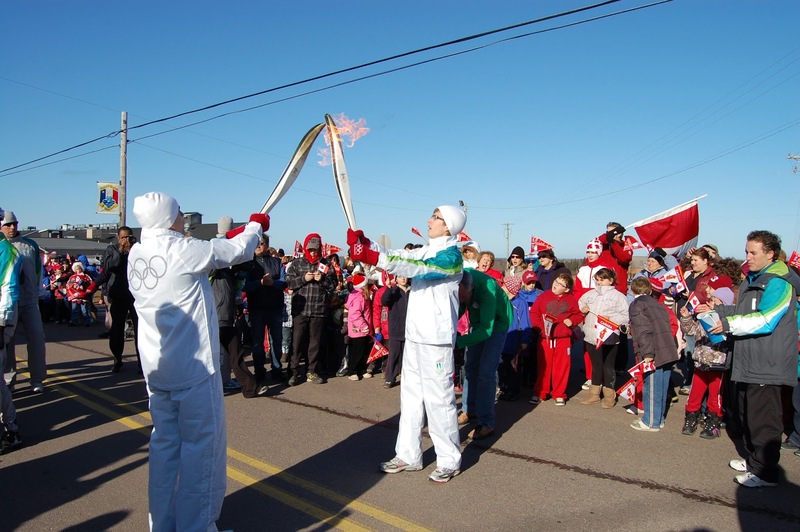 During the 2010 Vancouver Winter Olympics, they also outfitted the carriers for the Olympic Torch Relay. It was during this event that the famous red mittens were introduced, selling 2,6 million pairs that year alone. The scarf in the painting is from the 2006 Torino Winter Olympic apparel collection with coloured stripes reflecting the fives colours of the Olympic rings. The scarf was inspired from the iconic HBC wool point blanket with the four stripes in green, red yellow and indigo. The origin of the blankets dates back to the 1700's and were typically traded with First Nations in exchange for beaver pelts. I’ve altered the scarf to make it less Olympic and more in keeping with the Hudson Bay Company iconic wool point blanket by replacing a black stripe for indigo. I also changed the sewed on patch for the more recognizable HBC stripes that appeared on this year Olympic collection for team Canada. The sap from Maple trees to make the syrup was first collected and used by the indigenous peoples living in northeastern North America, and the practice was adopted by European settlers, who gradually refined production methods. The Canadian province of Quebec is by far the largest producer, responsible for 70% of the world's output. Vermont is the largest producer in the United States, generating about 6% of the global supply. (ref. Wikipedia). Acrylic on gessoed aluminium panel, 18 x 12"
Just in time for Valentine's Day, this is a follow-up painting to French Kisses (painting #247, 2017). Retaining the same theme, I'm paying an homage to French photographer Robert Doisneau (1912-1994,) a photojournalist who became renown for his street photography especially around Paris. "Chez Gégène, 1947" is from the Robert Doisneau- Graphique de France 1993 calendar. Chez Gégène is a restaurant with a terrace and dancefloor. The institution opened prior to World War I (1914-1918), more than 100 years ago. It's located in Joinville-le-Pont, 9.4 km from the center of Paris in a southeastern suburbs of French Capitol. 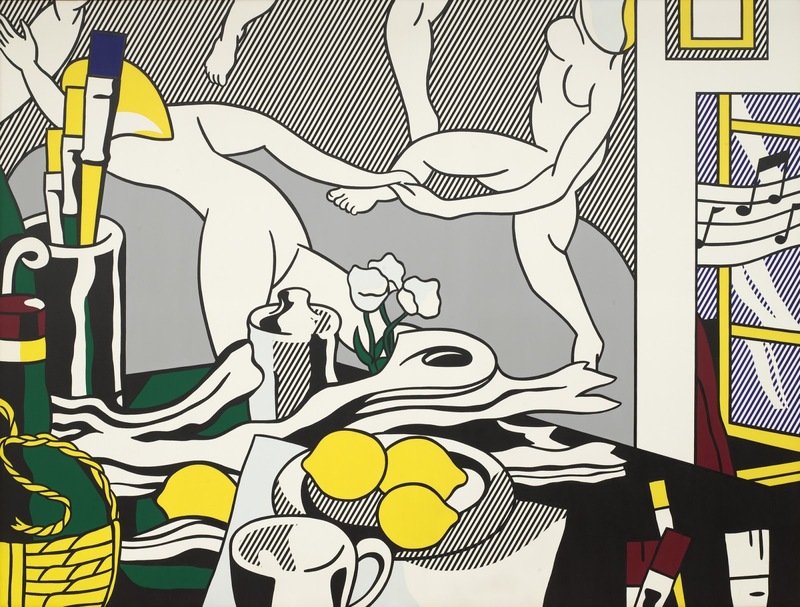 The image depicts two couples kissing on the terrace. This photograph is more than 70 years old, so the younger couple would now be around 90 years old. 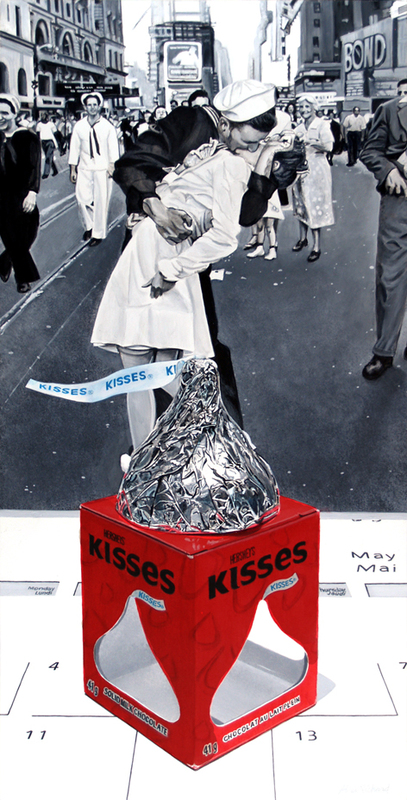 In the first French Kisses painting, I chose the month of February since my wife Suzanne and I got married on Valentine's Day. For this work I chose the month of June. The year 2018 will mark 30 years since we purchase our house, and moved in on June 24, 1988. Symbolically, we looked like the younger couple when we made that house a home....we now look like the older couple. I'm going to Paris later this spring. Time allowing, I might try to have lunch here! The majority of my artwork is about documenting aspects of popular culture and paying homage to luminaries who have made a difference in their fields. Ken Danby (1940-2007) is one artist whom I instantly gravitated to when I started to paint more than 30 years ago. I've flipped through Ken Danby: The New Decade written by Paul Duval (1984), so many times that the pages are falling out. I was especially fond of his egg tempera and watercolour paintings and the direction he took with the imagery. Also his earlier work that seemed influenced by Andrew Wyeth. Over the years, I've acquired three books and several catalogues of Ken Danby’s artwork. 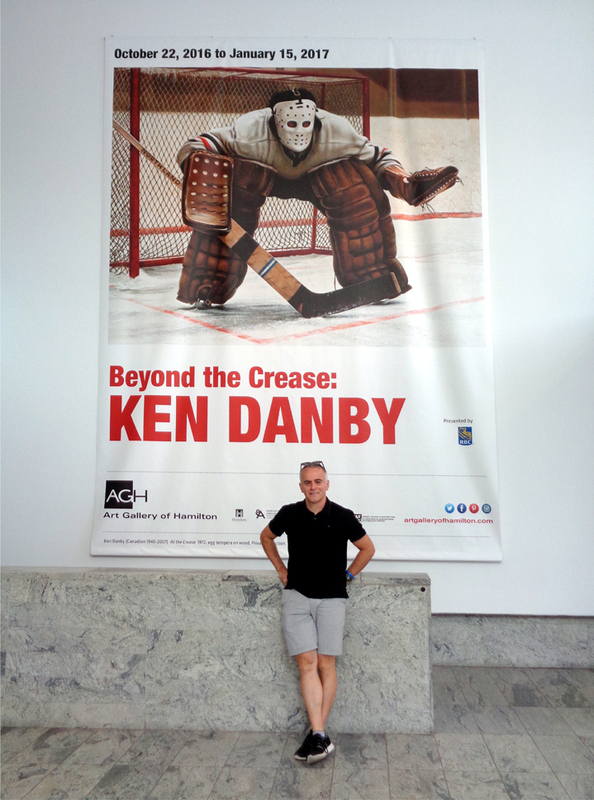 The most recent was published in conjunction with a retrospective held at the Art Gallery of Hamilton in the fall of 2016, entitled "Beyond the Crease". We were visiting the Niagara escarpment four days before the show opened and we were able to view a portion of the exhibition as it was still being mounted. I was very fortunate to view his solo show "Earth, Sky and Water" at the Bernarducci-Meisel Gallery in NYC, during the fall of 2002. I also own two of his serigraphs prints, the most recent acquired last summer from a German art gallery. Ken Danby's sudden passing on September 23 2007 shook me to the core. He was only 67 years old. He collapsed while on a canoe trip with his wife Gillian and some friends in Algonquin Provincial Park. Paramedics were unable to revive him. He was still playing hockey in a gentlemen's league called the "Guelph Goodtimers''. In 2017, one of my paintings was published in the book, "Ingenious" written by the Hon. David Johnston, the past Governor General of Canada and Tom Jenkins. The book celebrates Canadian inventors who contributed in making the world a better place. 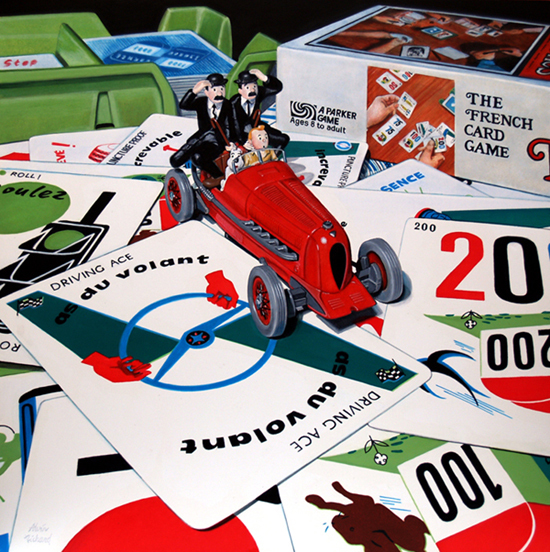 My painting used in the book was a commission piece paying homage to Edward R. McDonald who invented the first version of the Scrabble Board Game. 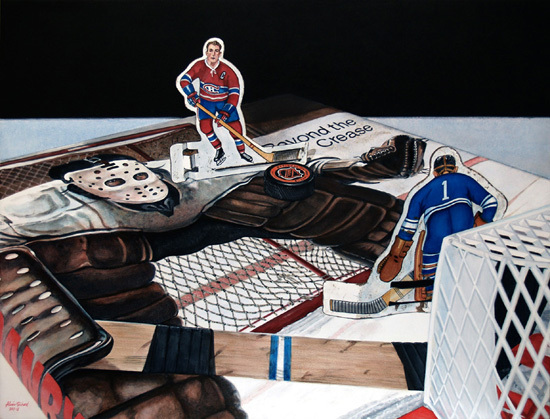 The idea for this new painting, "Hockey Night in Canada, 1972" (La soirée du Hockey, 1972) came to me after flipping through the book. Canadians are credited for inventing the game of hockey (p.180), the championship Stanley Cup (p.185), Jacques Plante inventing the goalie mark in 1959 (p.110) and Donald Munro for creating table top hockey in 1932 (p.194). 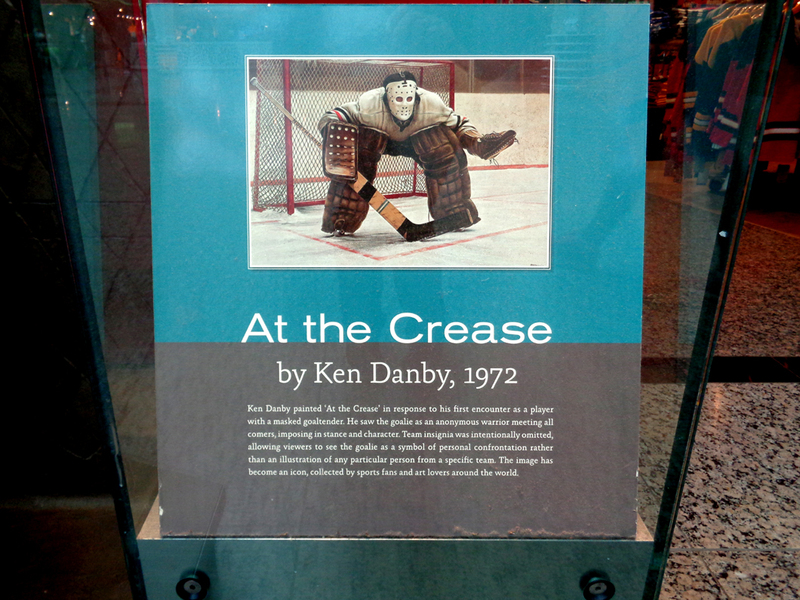 Ken Danby's iconic painting, "At the Crease" was painted in 1972. The Canadian Encyclopaedia has called At the Crease - "a National Symbol". An episode from the BRAVO! 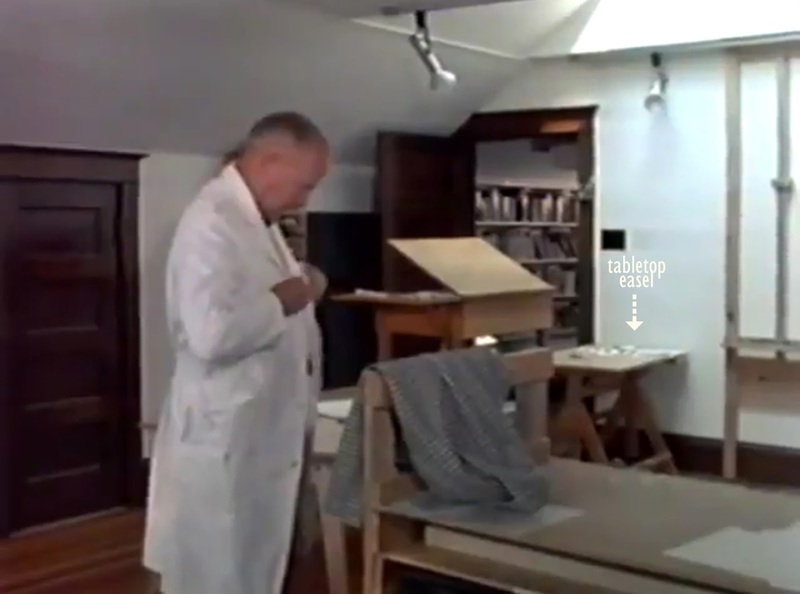 docu-series, "The Artist's Life" featuring Danby aired on television shortly after is passing. Here, he discusses his intentions behind the imagery. "I did that painting because I had to get it out of my system, based on an actual experience right here on this river playing hockey. Playing a game, the goalie, a young goalie was wearing a mask. Well it was the first time in my hockey experience after being away from it for some time that I was actually at ice level, skating on with a goalie, wearing a mask. That's why I painted that painting. It's a work that I resisted for 3 years because I felt that it was kind of Sports Illustrated". The team crest was intentionally omitted, allowing viewers to see the goalie as a symbol of personal confrontation rather than an illustration of a particular goalie from a specific team. 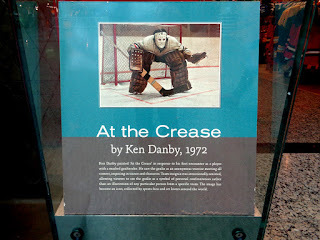 When the CBC Life & Times of Ken Danby that aired on November 2, 1998, it was stated that 100,000 reproduction prints of At the Crease had already been sold around the world. After researching as much as I could, the whole narrative came to me. I used 1972 as the timeline for my composition. That year, I was 10 years old. I remember clearly that Canada and Russia were playing game 8 in the Summit Series since the whole school gathered in the cafeteria to watch the last period on TV with Paul Henderson scoring the winning goal for Canada. It is also the year the I started to play pond hockey prior to playing in an organized league (Pee-wee & Bantam). With all of this said, I'm checking off several items from a list that is not just meaningful to me, but to millions other Canadians. - First off is paying homage to Ken Danby and his artwork. -Celebrating the 100th anniversary of the NHL in 2017. 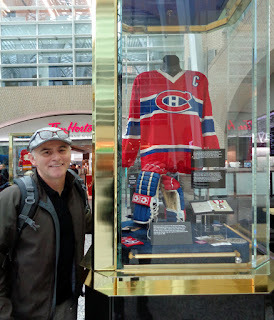 -Paying homage to my 10th cousin, Henri Richard, who in 1972 was team captain of the Montreal Canadiens. He holds the NHL record for the most Stanley Cup wins as a player with 11. I actually change the face of a generic hockey player to more youthful Richard, aka “The Pocket Rocket” because of this stature at 5'7" and 160 lbs, and added the “C” on his jersey. We share the same ancestor, Michel Sansoucy Richard who immigrated from France to Port Royal , Acadia in 1654 (now Nova Scotia). -Celebrating the longest rivalry in NHL hockey between the Montreal Canadiens and the Toronto Maple Leafs. Finding the props was somewhat challenging. I purchased the vintage 1960's Coleco tabletop hockey players on eBay, from a seller living in BC. 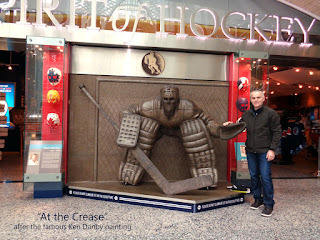 The hockey net was from a seller living in Nova Scotia while the puck was purchased at the NHL Hockey Hall of Fame store in Toronto during our visit this past October. The puck was larger, so I digitally reduced it to size and affixed the NHL logo. 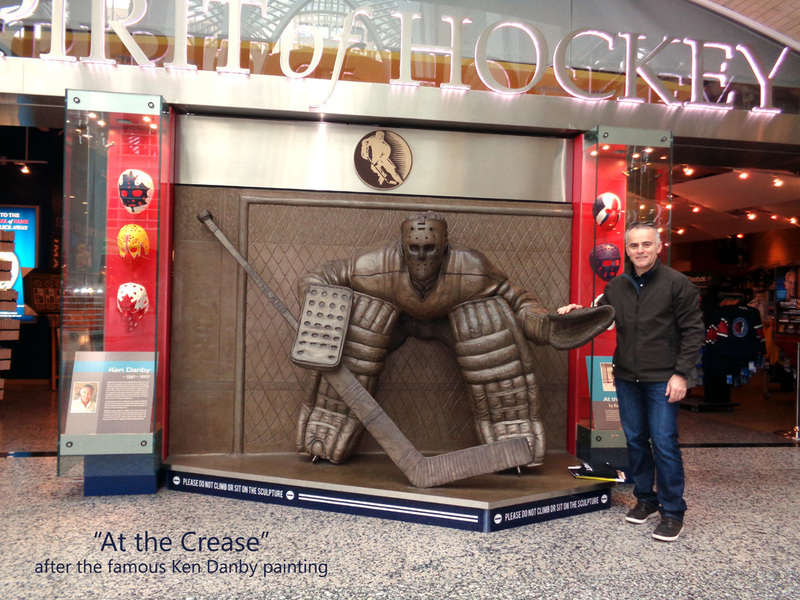 Just outside the NHL store, the atrium opens to retail outlets where a large bronze sculpture of Danby's, At the Crease is on display. 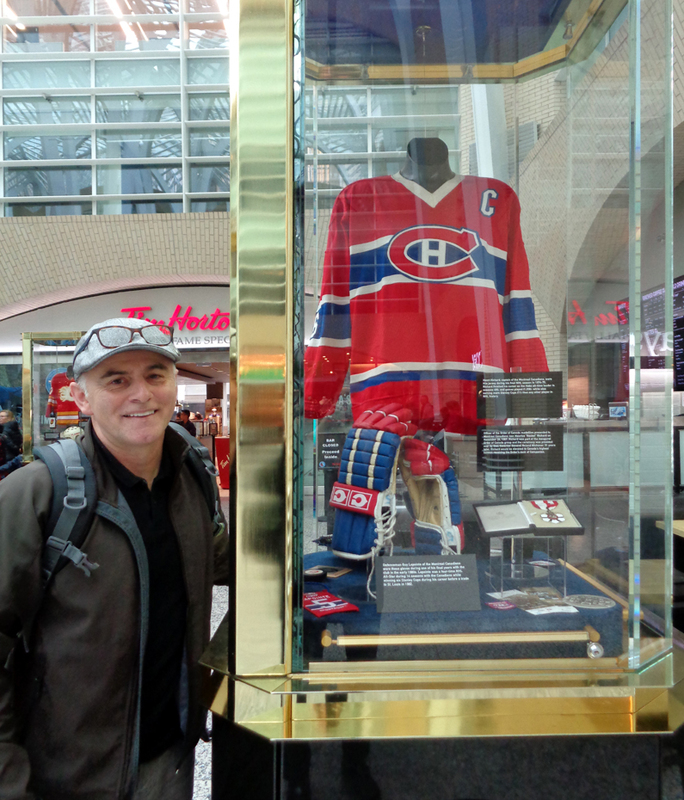 Outside the museum itself was a display case that had the last hockey jersey worn by Henri Richard as team captain. 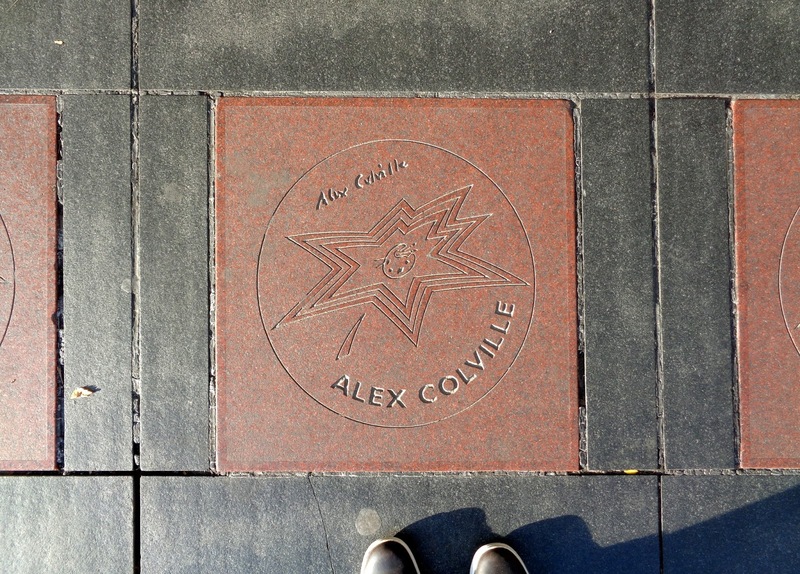 In 2016, Mount Allison University was the recipient of a generous donation from the family of the late Alex Colville, gifting the entire content of his art studio as he left it at the time of his passing. 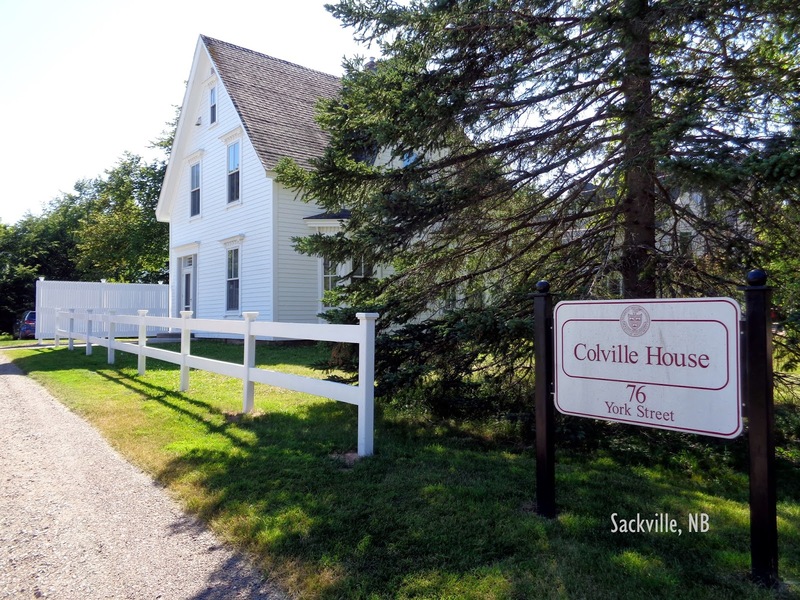 A variety of easels, furniture, artefacts and art supplies now have a new home in the Colville House located at 76 York Street in Sackville, NB. It was in this house that Alex Colville with his wife Rhoda raised their four children and lived from 1949 to 1973. 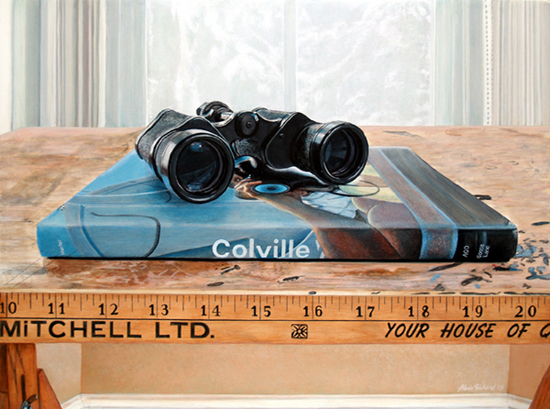 Colville was a professor with the Fine Arts Faculty at Mount Allison University from 1946 to 1963. They continued living in the house for another decade after he left his teaching position prior to moving to Wolfville, NS. The original studio in the Colville House was located on in the attic, a tight space with a 6 ft head clearance. It is here that he painted many of his best known work, including To Prince Edward Island (1965) that graces the cover of the book in my composition. This book was published in 2014 by Goose Lane Edition in Fredericton, NB in conjunction with a major lifetime retrospective exhibition of his work organized and held at the Art Gallery of Ontario (AGO), then later at the National Gallery of Canada in Ottawa. The Tasco binoculars belonged to my late father Raymond and are the exact same model as in To Prince Edward Island. I've been wanting to paint these binoculars for at least a decade. I grew up in Cap-Lumière, NB along the Northumberland Strait. On a clear day, we could see PEI even without binoculars. After I acquired the book all I needed was the proper setting. When my wife and I visited the Colville House last summer, the whole narrative came to me. I would return a few weeks later with book and binoculars in hand to do a quick photo session. This painting is an homage to two men who greatly influenced my life and my art. Alex Colville in his Wolfville studio, 1984. Still image from "Order and Splendor"
My wife and I visited Toronto two months ago to visit the city and attend Art Toronto. 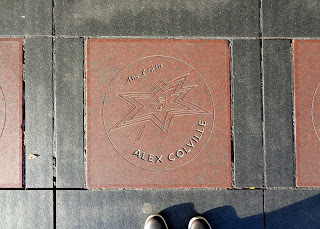 While exiting the Princess of Wales Theatre after attending the play ''The Curious Incident of the Dog in the Nighttime" we came across Alex Colville's Star on the Canadian Walk of Fame located on King Street. This painting is available from the Fog Forest Gallery in Sackville, NB, located 650m from the Colville House.